We believe the most important investment decision is proper asset class selection, which requires a highly disciplined and unemotional approach to evaluating risk/reward potential. The Leuthold Sector Rotation strategy aims to take advantage of the disparity in sectors during normal business cycles. Through an analysis of forward returns using market cycles, factor signal strength, and factor relative valuation, we seek to identify the most promising factors for a given market environment. Read Jim Paulsen's renouned weekly market newsletter, Paulsen's Perspective. Ideas for advisors to make asset allocation, sector or factor tilts based on our research. Take a test drive before making a commitment. Trial includes full access to our Advisors site. During the December carnage many Bulls were killed on the battlefield and others badly wounded. This year, although the skirmish has quieted, most remain on edge. However, investors may just now be jumping out of their foxholes because the Cavalry has recently been sighted coming over the hill with bugles blaring! In recent weeks, several factors have turned more accommodative both for the economy and for the stock market. We highlight just a few of the horses now comprising the cavalry. This week, Federal Reserve (Fed) Chairman Powell provided soothing commentary in announcing a dovish turn for monetary policy. He promised patience in raising rates, a slower approach in normalizing its balance sheet, and future changes in the funds rate (up or down) would no longer be on autopilot, but rather, tied to the performance of the economy. The Fed pushed the pause button on monetary tightening and assured everyone it stands ready to support the economic expansion if required. Effectively, the Fed went from foe to friend for investors in a little over a month! Bond Vigilantes Have Already EASED! From its low in 2017 at around 2%, the 10-year Treasury bond yield mostly trended higher until it peaked near 3.25% last November. Indeed, bond yields dovetailed with regular Fed fund rate hikes, and both pressured the economy and the stock market. 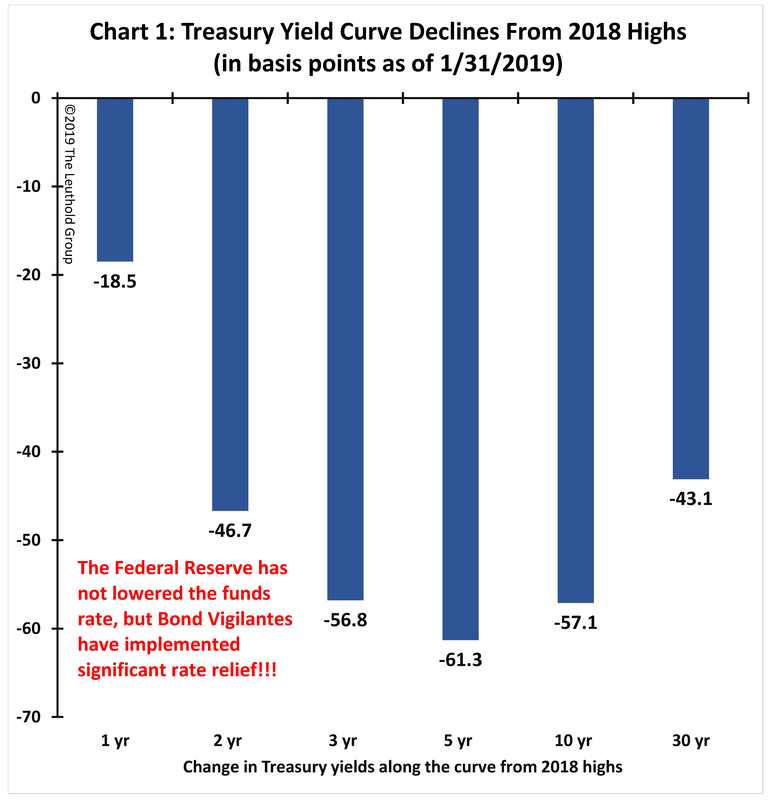 In the last couple months, however, while the Fed is now talking more dovish, bond vigilantes have acted! As shown in Chart 1, yields across the curve have recently been cut anywhere from about 20 basis points (12-month yields) to more than 60 basis points (the five-year Treasury yield). With a lag, lower rates should help revive economic activity and may already be helping to improve the valuation appeal of the stock market. For the first time in about two years, annual growth in the M2 money supply is accelerating (Chart 2). From the start of 2017 until late 2018, money supply growth slowed from about 7% to about 3.5%, significantly contracting financial market liquidity (i.e., the excess growth in the money supply beyond what is used to finance economic growth), since nominal GDP growth accelerated from 3.4% to 5.5% over the same period. A halving of the U.S. money-supply growth rate during the last two years is probably partially responsible for the recent economic slowdown. Similarly, a rare contraction in financial market liquidity in 2018 proved to be too much for the stock market. Fortunately, liquidity conditions have turned much more favorable recently. 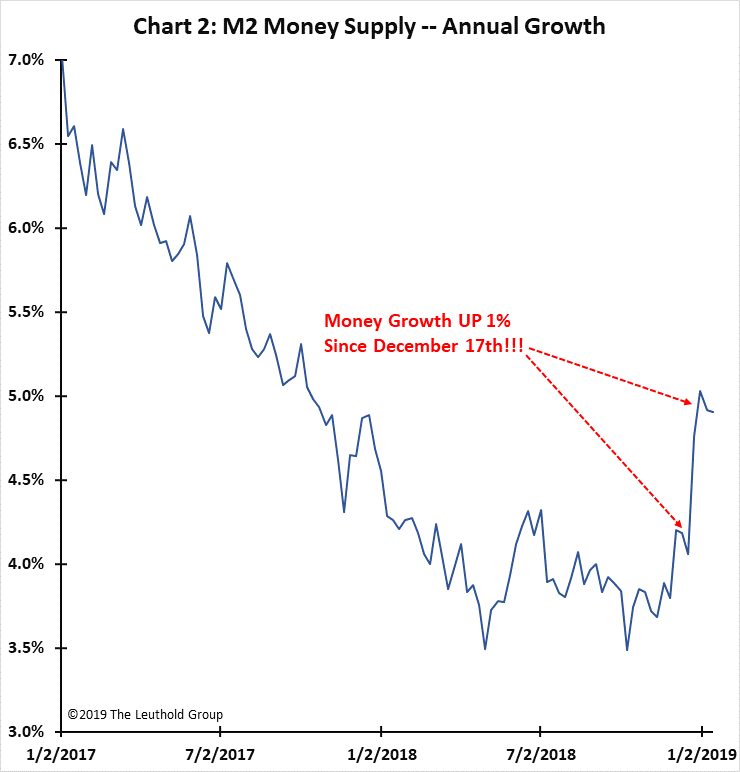 Annual M2 money supply growth has accelerated by about 1.5% in the last three months, and by 1% just since mid-December! Combined with slower nominal GDP this year, financial market liquidity could again expand in 2019. Fiscal Authorities Ride HEAVY In The Saddle! At the end of 2018, the federal deficit as a percent of nominal GDP (Chart 3) rose to its highest level since mid-2013. In the last couple years, growing fiscal stimulus has added to economic and earnings momentum. This year, though, it could play a central role in stabilizing and eventually reviving economic growth. 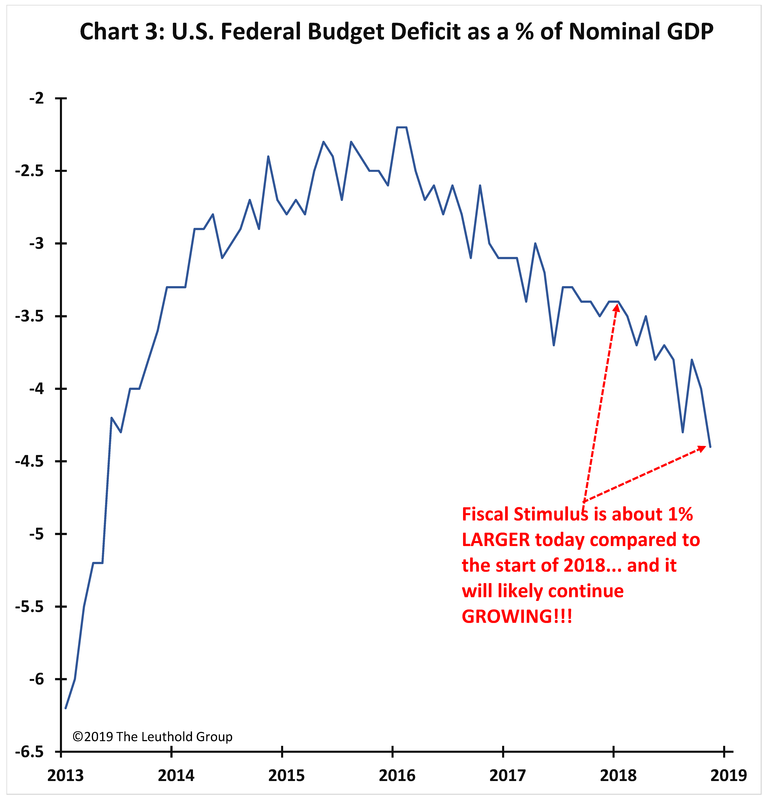 Net fiscal juice is now 1% more than it was at the start of 2018 and should expand further due to latent impacts from recent legislated tax cuts and a push from a slower-growing economy. Will fiscal authorities be riding heavy in the saddle this year (i.e., will the deficit approach 5% of GDP in 2019)? Both consumers and businesses start 2019 with much lower commodity costs. Overall, U.S. commodity prices fell about 20% from last year’s highs, while industrial commodity prices dropped about 10%. As shown in Chart 4, households are not only enjoying lower interest rates and lower tax rates, but also a 25% drop in gasoline prices! 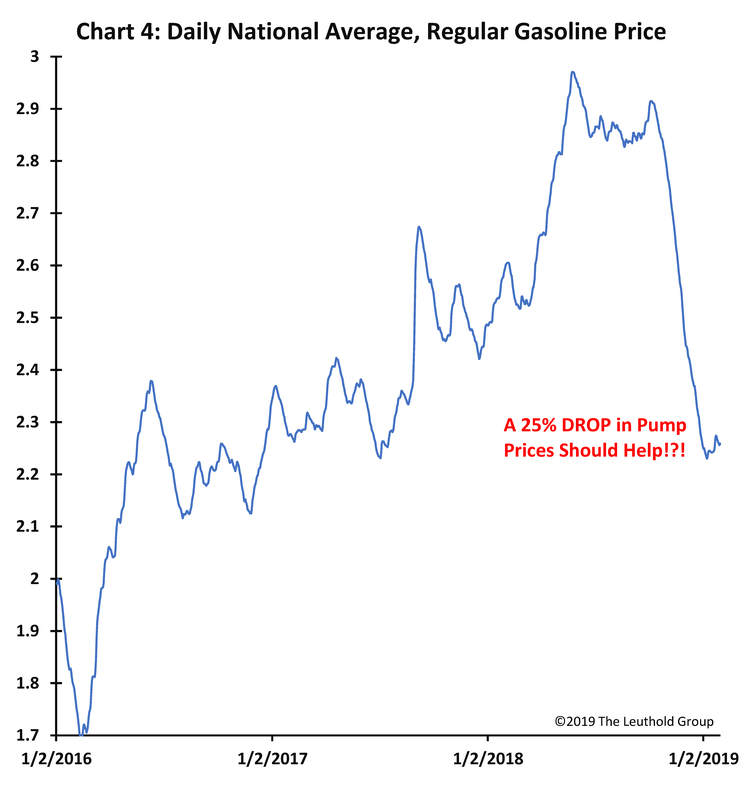 Regular gas selling near $2 a gallon to begin this year should help stretch household budgets compared to last year when prices neared $3 a gallon. An Oldie But Goodie Rides With Cavalry! “Refinancing” has been riding with the Cavalry for some time. Indeed, it rode a bit too fast in the last recovery, causing several households to get out over their skis. It has been less of a factor in this expansion, but as shown in Chart 5, it may be making a minor comeback. 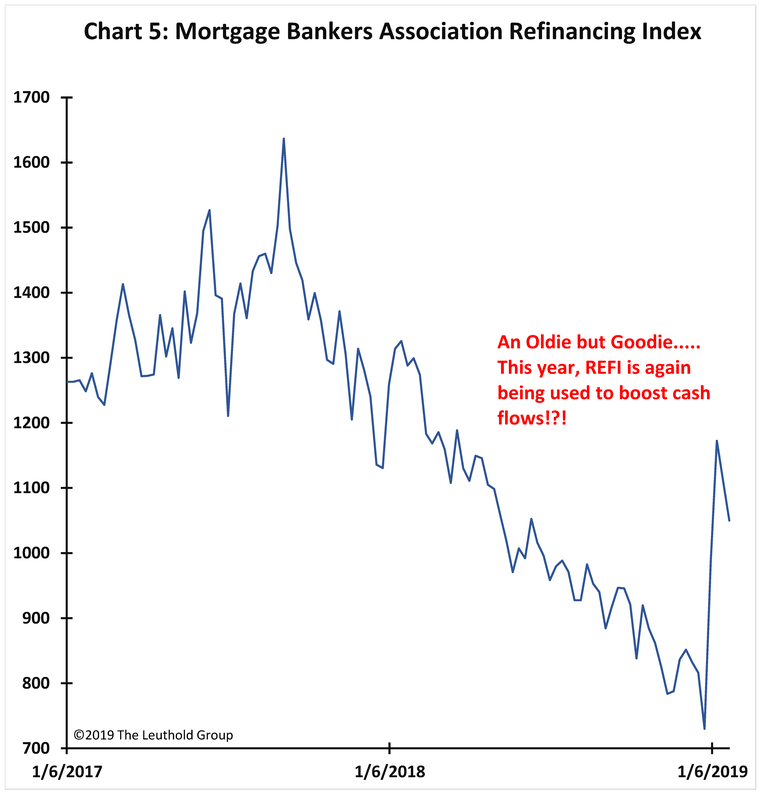 After steadily declining throughout 2018, the MBA Refinancing Index has spiked since late last year. The recent drop in mortgage rates may not yet be doing much for new housing starts, but it is helping to boost household cash flows. Dare we say, ‘Refi Rides Again’? As shown in Chart 6, U.S. national apartment-cap rates reached recovery cycle lows in December. Despite considerable turmoil in the stock market, and perhaps because of strong Millennial demands, confidence in the commercial construction industry appears to remain sanguine. 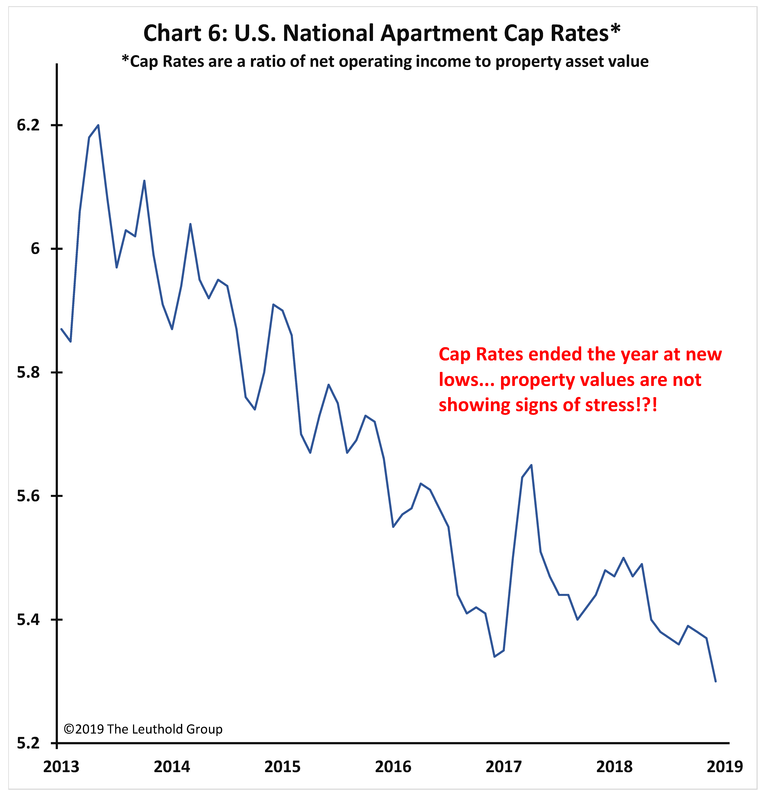 Often, the economy is hampered by rising cap rates as it suggests investor/developer hesitancy. Today, though, the Cavalry wears its ‘Cap’ proudly and this Cap seemingly has no floor? The Cavalry is bringing fresh ammo to those on the front lines. Since last July, wage inflation has accelerated from 2.8% to 3.2% while the annual pace of consumer price inflation has decelerated from 2.9% to 1.9% (Chart 7). Consequently, in five months, the annual growth rate in real wages has risen from -0.1% to +1.3%! 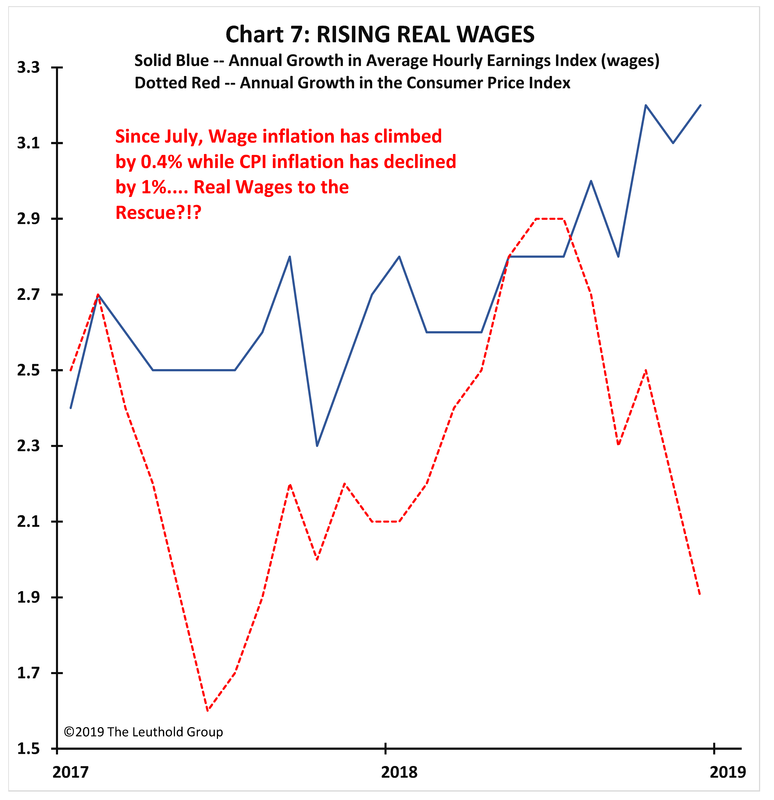 The last time real wage inflation rose this fast was in mid-2017, which was followed by a considerable acceleration in economic growth and a handsome stock market run. The front lines have again just been re-armed! Corporate Credit Costs Improving Again! 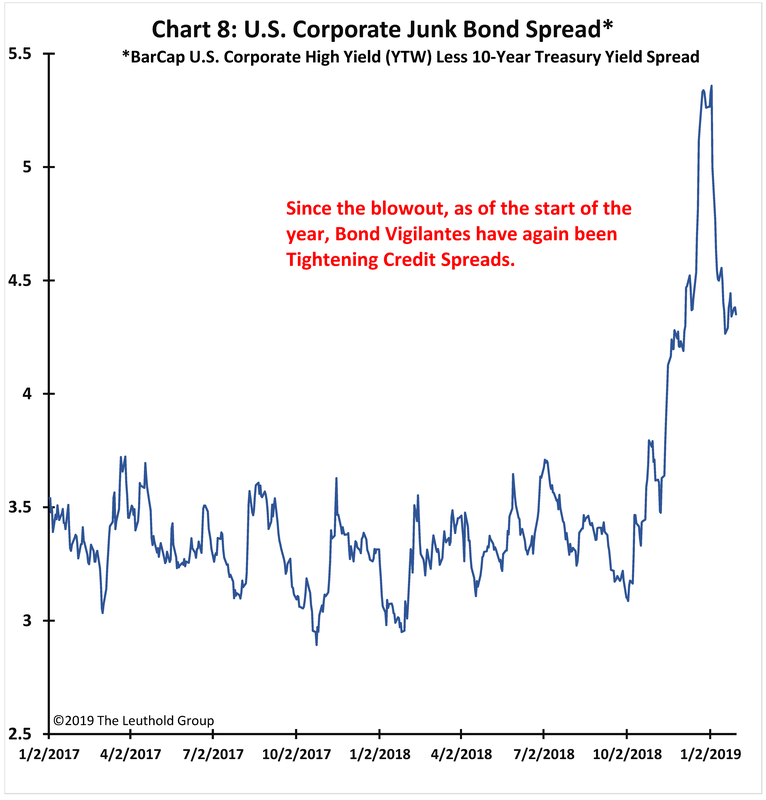 Corporate junk credit spreads (Chart 8) blew out in the fourth quarter but have recovered almost one-half of this widening since year end. Although high yield corporate credit costs are still about 1% higher, fears have lessened, and issuance has recently returned as bond vigilantes have again started to tighten credit spreads. A Couple Stray Horses May Still Join The Cavalry? Since 2015, the Fed has been slowly reducing its balance sheet relative to overall GDP. As shown in Chart 9, this runoff has accelerated during the last year, bringing more pressure to bear on both the recovery and the stock market. 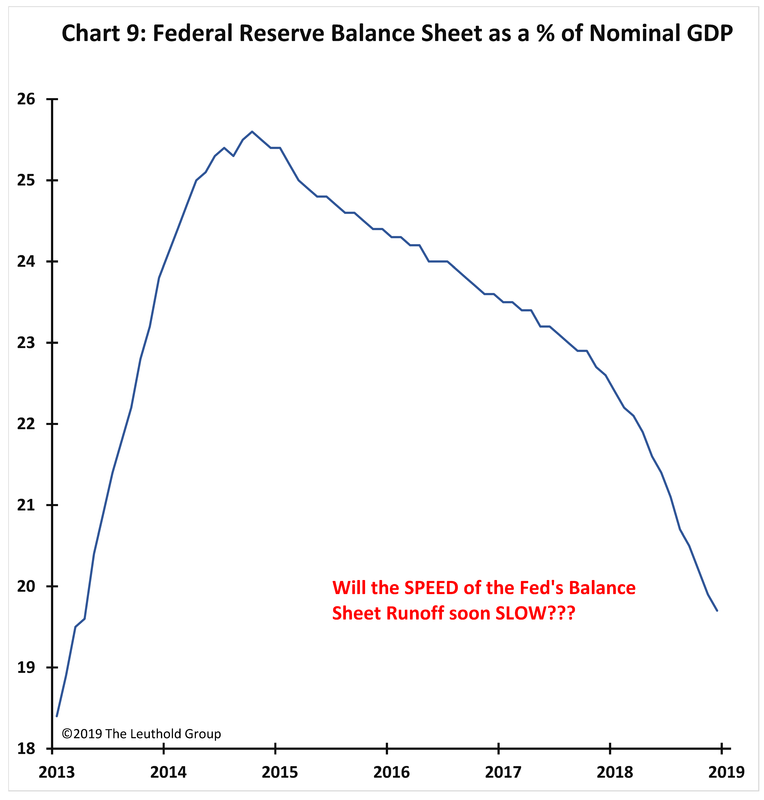 With the Fed’s pivot toward dovishness last week, it may not be long before the process of normalizing the Fed’s balance sheet slows significantly. Slower balance sheet normalization would boost monetary accommodation and lessen recession fears. 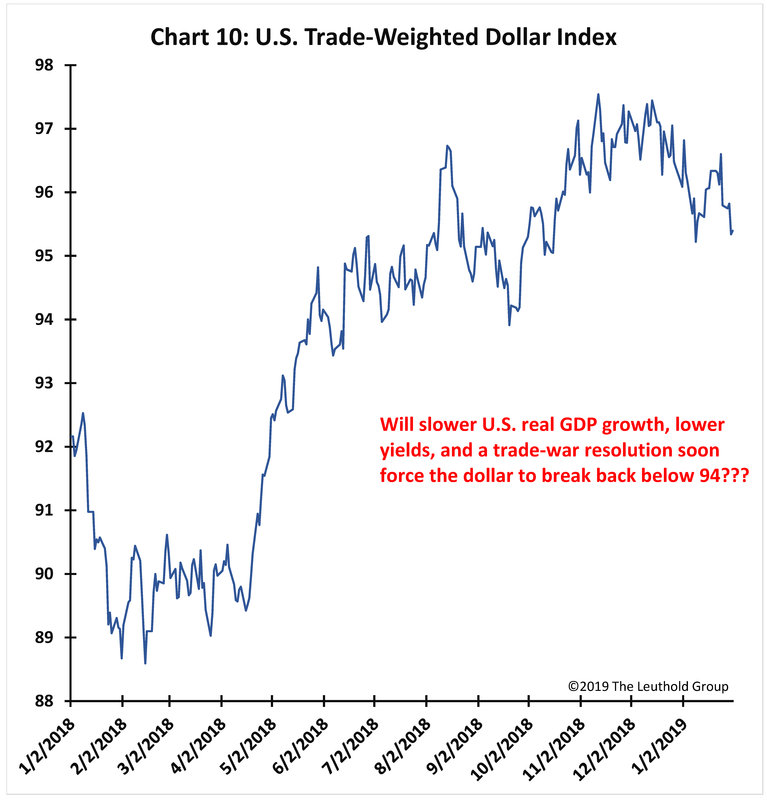 The U.S. dollar (Chart 10) is another stray stallion which has not yet joined the Cavalry. However, we believe the combination of slower relative U.S. economic growth (i.e., most foreign economies slowed earlier in 2018 and now the U.S. economy may be slowing more profoundly), lower U.S. yields, a less hawkish U.S. Fed, and a likely resolution to recent trade wars may soon cause the U.S. trade-weighted dollar index to break below 94 and, perhaps, reverse much of the gain achieved during 2018. A weaker U.S. dollar would help revive industrial activity, raise commodity prices, and boost overall economic and earnings growth. Perhaps it will take a few more months, but the Cavalry could soon be two horses stronger? Often, disasters bring considerable support. Such is the case so far in the aftermath of the December stock market debacle. It is not just about the Fed having a change of heart. Rather, the Cavalry is strong and broad, including the Fed, bond vigilantes (both lowering yields and tightening spreads), the money supply, fiscal juice, economic gifts (lower commodity and pump prices, strong cap rates, and rising REFIs), a re-arming of the household (with surging real wage growth), and possibly—eventually—a slower balance sheet runoff and a weaker U.S. Dollar. The stock market has rallied swiftly and a pause or some retest of these gains is plausible at some point. However, with the Cavalry now nearing full force, the fundamental support for this rally is also becoming more pronounced. If the Cavalry eventually convinces most that a recession is no longer imminent and the expansion is being revived, could rising investor sentiment and a higher price-earnings multiple allow investors to ‘ride’ toward new record highs? Interested in Investing in a Model? Contact us if you are interested in investing in our ETF models. The Leuthold Group is an institutional research firm and asset manager. Founded in 1981 by Steve Leuthold, we are we are recognized for a philosophy that stresses quantitative measures of value combined with recognition of fundamental and technical trends.